Fun and creative fiber and mixed media classes with renowned local and national instructors are scheduled at our store in Alexandria, VA on a regular basis — view our current lineup now. We offer classes to build a community of inspiring teachers and students — students who want creative freedom, students who are ready to create from their hearts, students who want to discover their voice. It is our goal to encourage everyone who searches for the creative voice the opportunity to practice and to experience new techniques and mediums. Learn more about our store, including directions and accommodation information if you are traveling here for a class. Our workshops offer a creative and supportive environment with sharing artists — view our current classes now to register online. All Artistic Artifacts instructors are talented artists themselves, comfortable sharing their experiences and creative techniques. We are always looking for new ideas, so contact us with your thoughts and requests. We are always happy to arrange a custom class to suit your schedule! 2nd Thursday: “How Do I ...?” — learn how to use new products from our shop or existing products and techniques that may be new to you ( learn more;). 3rd Thursday: Hand Stitch Third Thursday — No prior embroidery stitching experience is necessary, and all materials and tools are supplied. 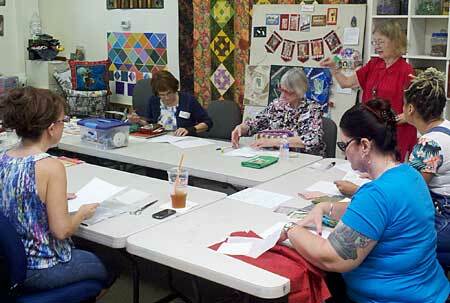 Learn to stitch with different threads, on different surfaces and more. 4th Thursday: Technique Thursday: Quilting Skills: a series of mini quilting classes so you can learn (or refine your skills for) sewing techniques. 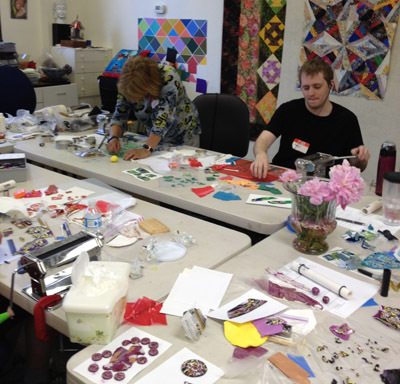 At Artistic Artifacts, we want to encourage you to be creative ... yes, it does take practice!